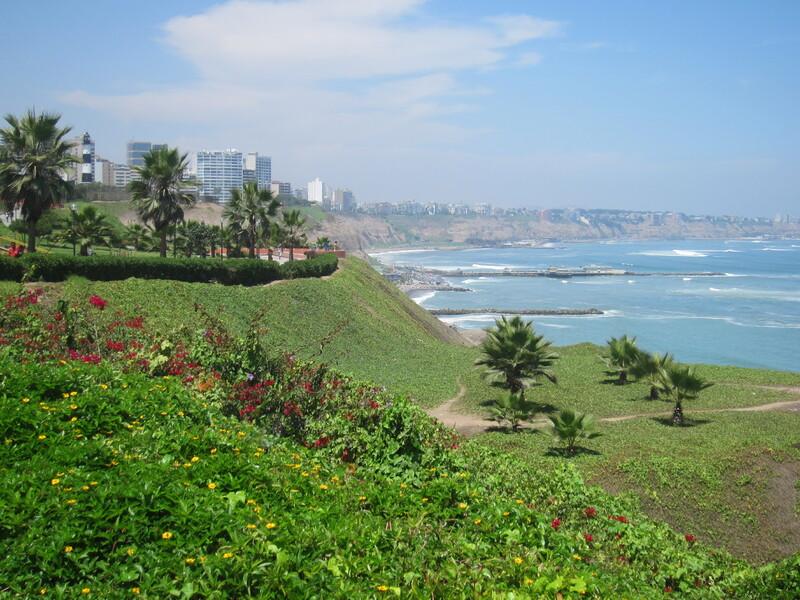 Lima: dirty, polluted, congested, poor, unsafe. Yes, after spending 10 days here it’s definitely all those things. But it’s also beautiful, luxurious, quiet, and filled with lovers, families, and adorable poodles out for a walk. It’s a city of contrasts. We stayed in a nice area and I will surely miss it while battling post-vacation depression. 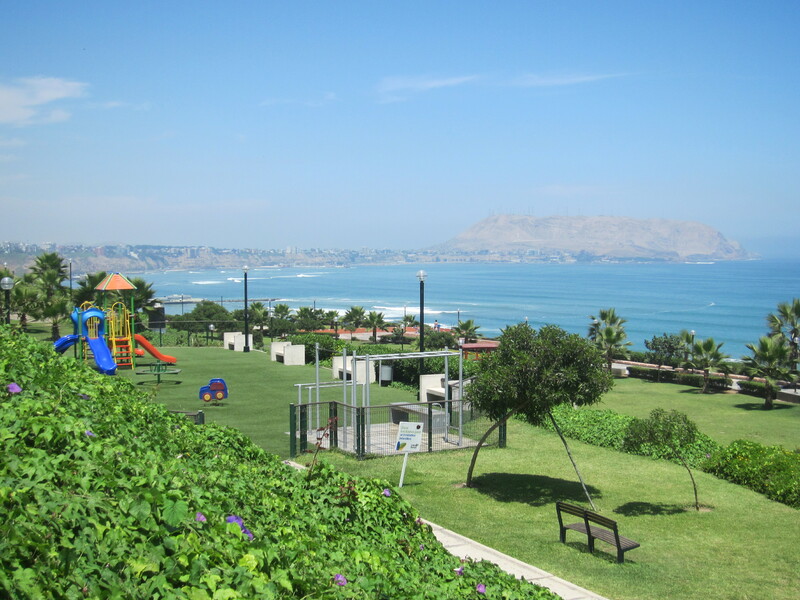 Miraflores, which roughly means “look at the flowers” in Spanish, is an apt name for this district of Lima that is filled with parks populated with pretty flowers. 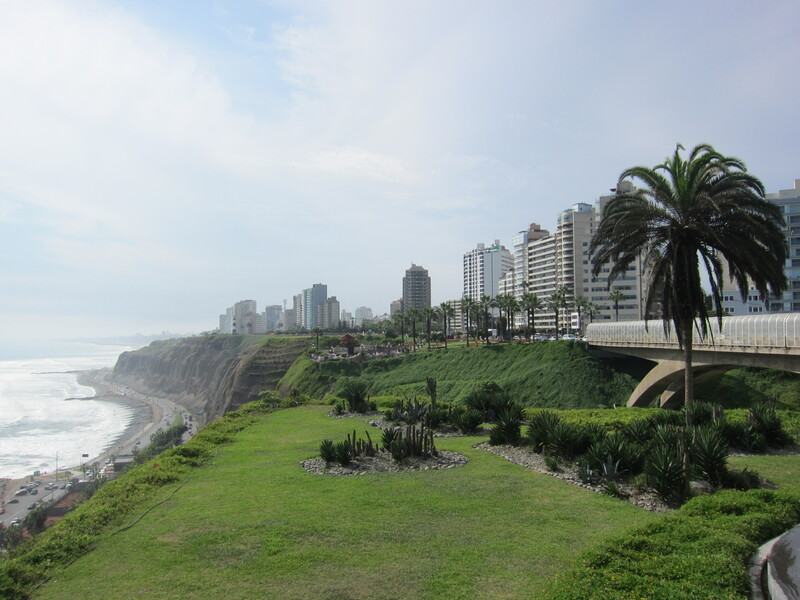 Our first day in Lima was spent walking along the Malecon, a long boulevard that stretches along the ocean. Cliffs to the west and luxury high rises to the east. 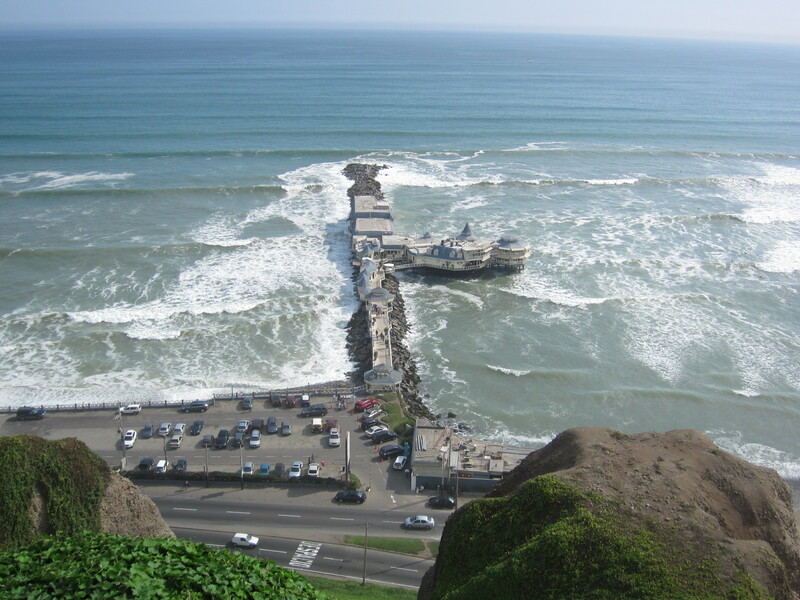 Below the Malecon you have a view of the (largely rocky) beach and the Pacific Ocean. A long flight of stairs in the northern portion allows joggers and pedestrians to go up and down. Looking at these photos, can you ever guess that Lima is the second most populated desert city in the world, behind Cairo? Strollers can spot surfers in the ocean and paragliders in the sky. 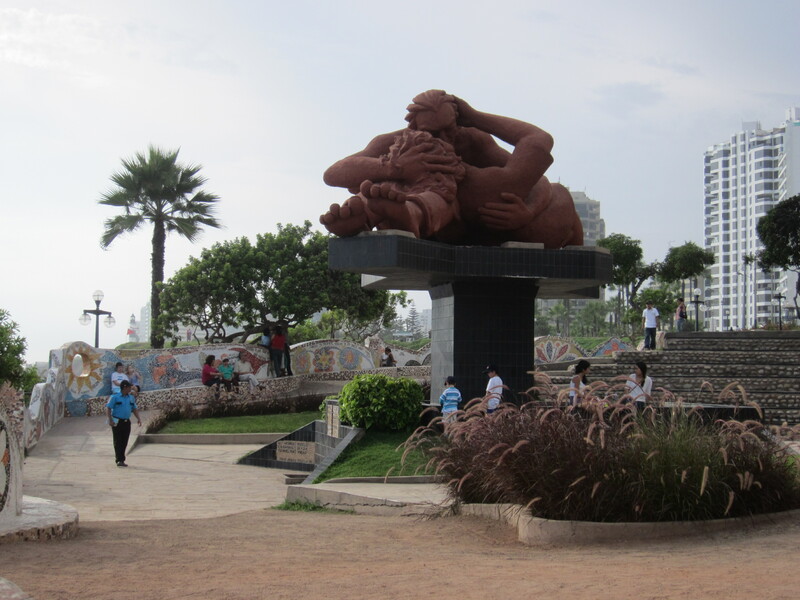 Towards the middle of the Malecon is a giant sculpture (El Beso – The Kiss) by Victor Delfin, one of Peru’s most famous artists. Surrounding this sculpture are bright mosaic walls with romantic quotes. As you can imagine, the benches here are usually filled with lovers out on dates. 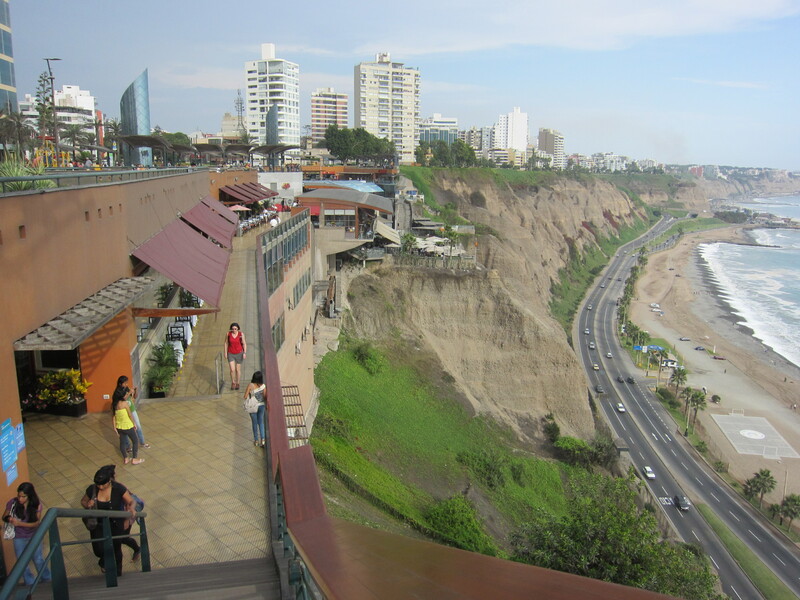 A mall is a place you usually won’t find me in, especially during valuable travel time, but Lima’s most famous mall, Larcomar, is an exception as it’s built into the cliffs. Several restaurants have patios with gorgeous views. 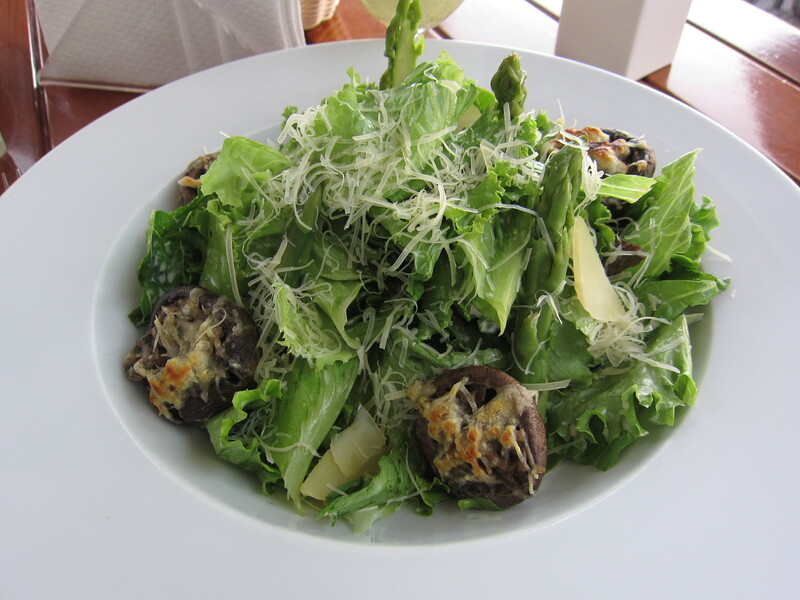 We ate at Mangos our first full day in Lima and again earlier today. The sounds of the ocean waves crashing against the shore are so strong that at first Hubby thought it was a soundtrack. Overpriced it sure is but the view can’t be beat. 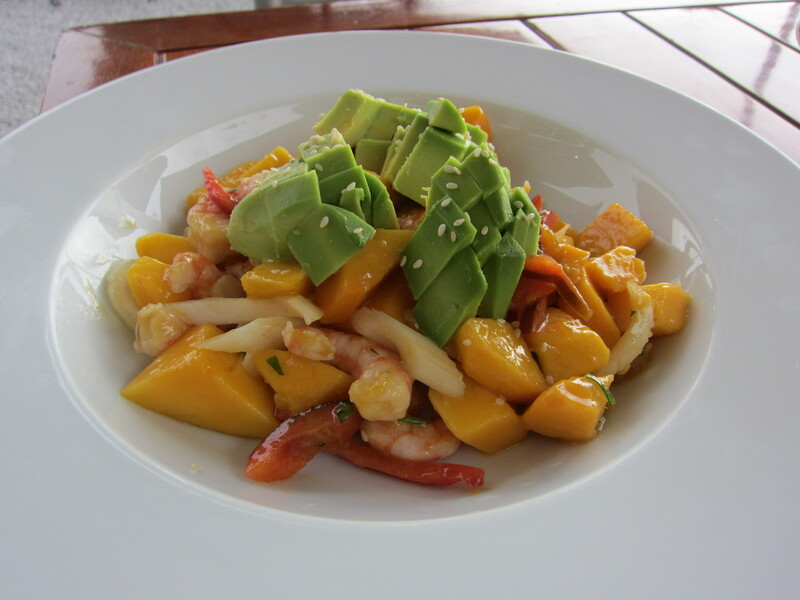 And I actually loved their mangoes, avocado, and shrimp salad. The sky was absolutely clear with no fog for our last day in Lima so we spent a few hours just chilling here taking in the views for one last time before our flight out. 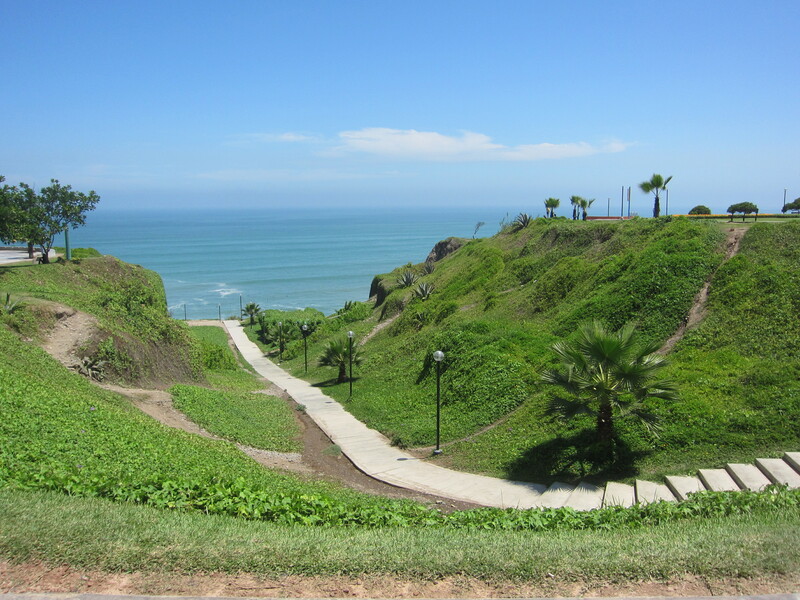 I can’t wait to share all of my Lima adventures with you in the coming posts! Your brother will definitely have an adventure! Yeah! I am hoping to visit him there during his second year, but we still don’t know where he will be placed. Your pictures look beautiful though, so it’s a comfort to me. I agree with your definition of Lima. It has all of that. It’s messy city but chaming as well. But I’m not really objectif because I lived in that city until the age of 20 years. Every street reminds me of something. 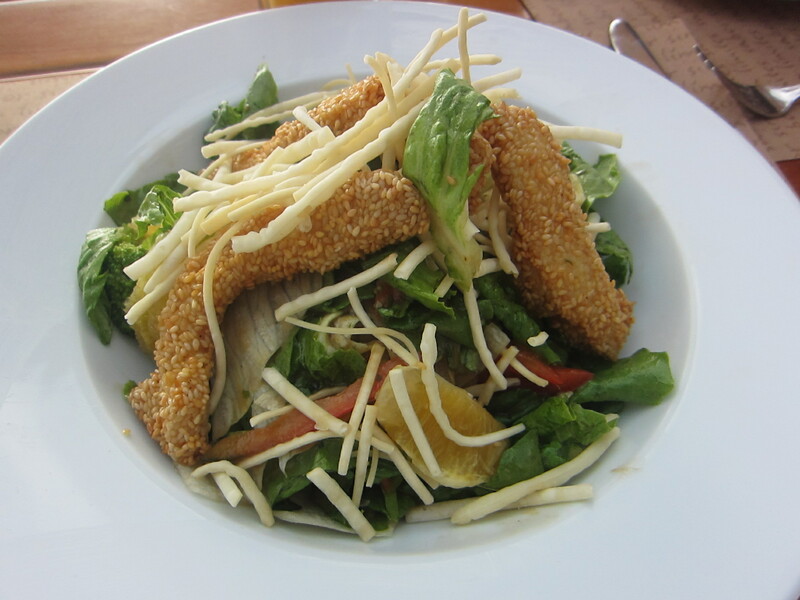 But I’m sure of one thing, Lima is a wonderful place to eat. I hope you had a pleasant stay at home and we will see more photos in your blog soon. I’ve never been to Peru, although I’ve spent time in other countries in the region. It is interesting to see the contrast between the “bad” and the “good” in any country, and to be able to be realistic about it and enjoy the fun stuff. I enjoyed seeing the photos and especially the one of the Kiss sculpture. I like it! I wonder if that one could be displayed publicly in the US. In the U.S. parents would probably complain that the sculpture will lead children to *gasp* kiss! Beautiful pics – thanks for sharing!